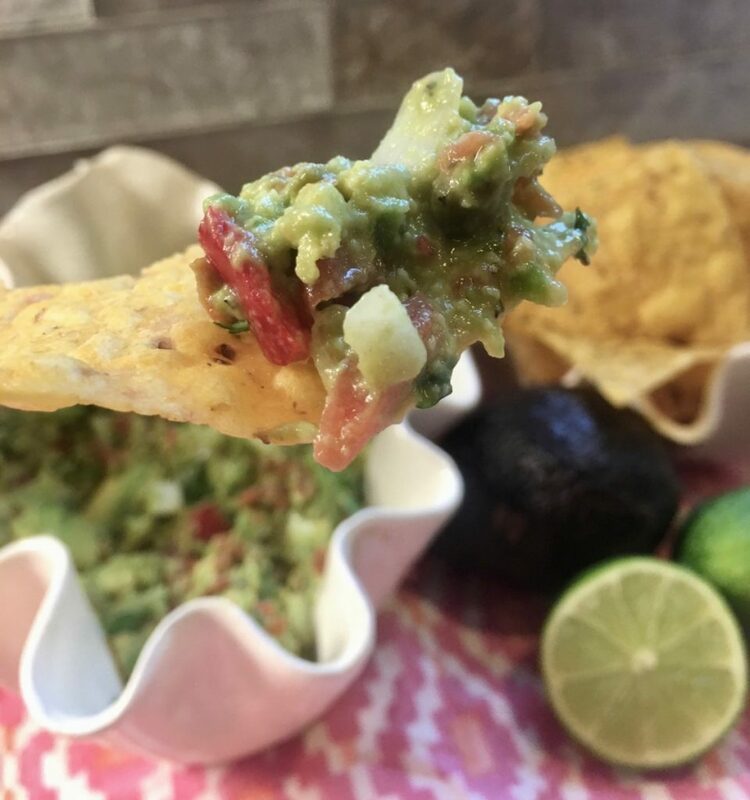 If you want to wow guests with a fresh, healthy and delicious appetizer, Dos Caminos’ fresh guacamole recipe is one you’ll want to bookmark and try asap. It is fantastic!
. FolkMy friend Cindy shared Dos Caminos’ fresh guacamole recipe with me last year, and I’ve made it countless times since. 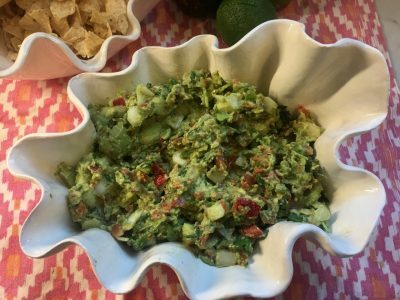 It is the freshest, most authentic guacamole recipe I’ve ever found and is decidedly our favorite. Chef Ivy Stark shares on Serious Eats how guacamole is made tableside at New York’s popular Dos Caminos. A slideshow of photos shows step by step how it is done. The keys to this recipe are using the freshest ingredients possible. Also, the first step involves making a chili paste; this is a key factor to releasing the full flavor of the ingredients. Since falling in love with this guacamole, I’ve kept all the fresh ingredients on hand so that I can make it any time. Here are a few things I want to mention about handling and storing the fresh ingredients you’ll need for this recipe. Jalapeno and serrano peppers should be diced with gloved hands! The heat is in the seeds, and if the oils from the seeds get on hands, it can burn cuts or get in your eyes later. Instead of dicing plum tomatoes, you can use the “fresh salsa” in the refrigerated section of Publix (and Costco). If you drain the liquid, you have a perfect substitute for diced plum tomatoes. Since dicing onions makes my eyes hurt like crazy (Lasik made them dry), I usually buy fresh diced purple onion in the produce section. If you prefer dicing your own but hate the tears, I highly recommend these savvy onion goggles. I never cut onions without putting these on; my eyes can’t take the fumes. Make ahead: Peppers and onion can be diced ahead and stored in the fridge. Once made, the guacamole should be eaten within a day or two before it begins oxidizing. The Kitchn shares here how to keep guacamole green; it really works! I always prep my avocados with this avacado slicer that peels, slices and dices avacado easily and uniformly. Since it would be totally unhealthy for me to serve this every night with chips, I’ve incorporated some other options for serving guacamole. Some of our favorites are carrot chips (precut bagged are easy), cucumber slices, and Stacy’s pita chips (not great but an alternative to tortilla chips). We also eat this guac as a side dish by itself. It is great spread on toast for breakfast or on top of a burger~no bun needed. If you make the Dos Caminos version or your own version of fresh guac, please leave comments and share your thoughts. As always, thanks so much for stopping by. Be blessed, and stay savvy!!! 2 Large avocados, peeled and seeded. Stark recommends California Haas avocados.